*Planning Commission and Jawaharlal Nehru University, New Delhi, abhijitsen2002@yahoo.co.in. Lipton, Michael (pbk. 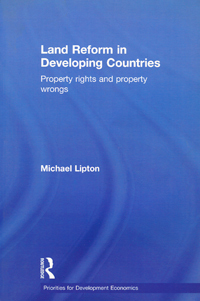 2010), Land Reform in Developing Countries: Property Rights and Property Wrongs, Routledge Priorities in Development Economics, Routledge, Abingdon. Wherever land is the source of livelihood for the majority, and thus defines boundaries of dominance and class relations, the demand for land to the tiller has historically been the most powerful slogan of peasant radicalism. Opposed bitterly by ruling landed elites, the very idea of land redistribution is traditionally associated with civil wars and political revolutions. Agrarian reform, and the concomitant slogan of land to the tiller, have always, of course, been central to the agenda of the political Left, particularly in less-developed countries. The fact, however, is that discussion about redistributive land reforms in developing countries commanded a surprising degree of agreement across a wider political spectrum for about three decades after the end of World War II – that is, after the United States forcibly implemented such reforms in Japan and also lent some support to land reform elsewhere. Since land reform is essentially about altering existing rights over the ownership and use of an asset that is always highly valued in every society, such consensus in this sphere – where even those committed to capitalism and to the defence of property rights conceded that there might be circumstances under which such rights could be trumped by other considerations, such as social equity, economic efficiency, and good governance – was unusual. Of course, this was an unusual period, when capitalism had to contend with the occupation by socialism and communism of a large segment of the ideological space in less-developed countries, many of which were emerging from colonialism. In this contested context, the defence of property itself required that some limited land redistribution be made possible through orderly legislation, in order to forestall more radical outcomes. The ensuing climate was fertile ground for different shades of Left opinion, from political scientists through sociologists and economists to lawyers, both in less-developed and developed countries. It was also exciting, since all actual attempts at legal land redistribution continued to be opposed strongly not only by the landed elite in developing countries, but also by monopoly capital everywhere. Nonetheless, an intellectual consensus existed even among some on the Right that this was an area where the existing distribution of property rights could legitimately be questioned. As with much else of the post-War consensus, accord with respect to land reform began to crumble in the 1980s and did so completely with the collapse of the Soviet Union in 1991. In the same manner as most post-1991 intellectual trends, the case against land reforms was built softly-softly, mainly in terms of agrarian reform being another example of usually ineffective and often counterproductive state interference. The dismantlement of state and collective farms in Russia and Eastern Europe actually gave a fillip to that shade of pro-land reform opinion that opposed collectivisation and had welcomed China’s earlier shift to the Household Responsibility System. Agrarian “reform” was now seen mainly in terms of the restoration of private property rights and the withdrawal of the state. As far as the old notion of land reform is concerned – the redistribution of private property rights from the rich and powerful to the poor in the countryside – the dominant view on the Right today is that this idea is either already dead or ought to be. land reform is a live, often burning, issue twenty years after the end of the cold war. The debate about land reform is alive and well. So is land reform itself. And so they should be. As with his earlier works, this is a weighty volume, almost a compendium, full of views that should provoke debate even amongst those who would consider the whole issue of land refom to be a closed chapter. [L]egislation intended and likely to directly redistribute ownership of, claims on, or rights to farmland, and thus to benefit the poor by raising their absolute and relative status, power, and/or income, compared with likely situations without the legislation. It is his conclusion that the case for land reform, as defined above, is alive and well. But why this specific definition? Essentially because Lipton wants to focus debate around a clear, widely defensible but narrow definition, especially since the usage of the term “reform” has itself undergone profound changes. He specifically excludes changes in law that merely free up land markets, although he includes “new wave” land reforms that have a clear goal of redistributing to the poor while being more market-friendly than more classic land reform. Likewise, by linking his definition to legislation he excludes revolutions, land gifts, and illegal land seizures in order to highlight the rule of law (although the definition does admit laws that subsequently validate acts of revolution, gift, or seizure). The crux of his definition is direct redistribution that improves the position of the poor, although this may not involve all the poor and may in fact fall far short of the original aim. This last caveat is important since, although Lipton claims that “at least 1.5 billion people today have some farmland as a result of land reform, and are less poor, or not poor, as a result,” he also notes that “in almost every country where land reform has happened, its proponents denigrate it.” The truth is of course that huge inequalities in land ownership remain even in most countries that have enacted redistributive land reform. And, a purpose of this book appears to be to rally the faithful towards unfinished tasks rather than sink into pessimistic acceptance of the death of land reform, as many are doing. That not all land identified for redistribution has been redistributed, nor all the poor reached, is no reason to write off what his statistics from around the world suggest have, over the last five decades, actually been “enormous social changes, challenging some rural tyrants and placing land and power in the hands of some rural masses for the first time for centuries.” Moreover, although it is true that land reform does not figure as prominently in either political rhetoric or the development literature as it did from 1945 to 1990, many political struggles are still over land issues. These remain central to the politics, sociology, and economics of the many countries where agriculture continues to be the single largest source of livelihood. Is it, then, that some other factors – demography and technology, for example – have made land redistribution less appealing? The main argument of those opposed to land reform has always been that there is simply not enough land to go around, and that, therefore, land reforms can reduce farm size below some critical minimum, reducing output and investment to the detriment of all. This is, of course, simply an old defence for inequality, one that says that trying to divide a cake too equally may reduce the size of each piece so much that no one may get enough. Applied to land, this argument has always had takers, even among those who support land redistribution. The classic land reform model involved appropriation only from those who owned land above some ceiling, and also incorporated some notion of a minimum holding-size for reform beneficiaries. Clearly, as population increases and farm-sizes become smaller, such ceilings and floors reduce the possibility of distribution from rich to poor households. Lipton accepts this, and also opposes the Communist view that collective farming may be a solution to the contradiction between equality and efficiency created by the need to have a minimum size of farm. He terms collectivisation a “terrible detour,” and his definition of land reform excludes this (and includes de-collectivisation) by requiring redistribution to poor individuals and households. Consequently, much of the discussion in the first six chapters of the book is about returns to scale in farming, about the relationship of this to technology, and about “false trails” – including both collectivisation and the notion that technologies such as the “green revolution” have made land reforms unnecessary. It is therefore in these earlier chapters that Lipton the economist is best visible, giving way somewhat to Lipton the campaigner – or preacher – in his last grand chapter. The earlier chapters are full of detailed discussion of the theoretical and empirical aspects of various debates, ranging from the debate on the relationship between farm-size and productivity, covering the issue of whether small farms are more ecologically sustainable, to the role of markets in the context of land reforms. The care with which this is done, and Lipton’s sifting through the many minutiae involved, often leave the reader gasping for the big picture. For example, while generally weighing in on the side of small farms in the context of the size–productivity debate, Lipton is unwilling to accord with “small is beautiful” in the context of sustainability. The point that he correctly makes is that technology matters. He does not agree with those who claim that the “green revolution” made land reform unnecessary, because this technology in fact made small farms more viable. Since the earlier chapters are about past and often continuing debates, there is much in these that will not be acceptable to all. Quite apart from the above, Lipton’s views on collectivisation/de-collectivisation, on tenancy, and on the relevance of the “new wave,” market-friendly land reform are all likely to draw criticism from both sides of these debates, especially since he is both forthright and usually unaccommodating. While critical of collectivisation and appreciative of China’s shift to “household responsibility,” Lipton is scathing about much de-collectivisation in East Europe and the former Soviet Union. While he is sympathetic, on the whole, with the market-friendly reforms advocated, for example, by the World Bank in South Africa, he is aware that any talk of reform without imposing some non-market compulsion on the rich would be at the cost of the poor. The canvas is wide and, although detailed, rather discursive. To put it very bluntly, even after reading and re-reading, the final big picture may remain somewhat hazy to a reader seeking full clarity on matters involved. But this is perhaps what Lipton the economist really wants: to show that deep issues are involved, that many are currently being debated, and that the debate will continue. After all, this is one sense in which land reforms are not dead, and, because much of the present action is in Africa, where the choices are, say, between the South African and the Zimbabwean paths, many supporters of classic land reform are often left in a quandary. Indian readers will find much information in the book about other countries that is not usually available, and a flavour of issues still current elsewhere. On the Indian situation, however, there is no clarion call in this book. If anything, there are references to the Planning Commission, and a sense that there is not much land left in really large holdings and that the way forward may only involve a guarantee to the poor of homestead land with at least garden plots. The book does not deal specifically with tribal land issues in India or the Scheduled Tribes and Other Traditional Forest Dwellers (Recognition of Forest Rights) Act, which is the most recent land reform measure. And, although mentioned, rural resistance to the acquisition of agricultural land for non-agricultural purposes is not a part of its discourse. The definition of land reform that Lipton uses limits him to considering only the distribution of farmland and does not extend to the conversion of land use from sown area to another category. Lipton does not reveal his mind about the new accumulation of land that is occurring across the world. This is a pity, because much of what is presently happening in China, India, and even other parts of the world including Africa, cannot really be understood without extending the canvas of land issues beyond the farm itself.